1. As you can see, we’ve gone to a darker color scheme, to reflect a darker time in Brianna’s life. We’re approaching the end, so this is the final color scheme, at least until we come back to present-day Brianna telling the story. 2. As I mentioned in an earlier post, I originally planned a longer scene showing the Ultimage fighting the castle guards, but I cut it. I realized that there’s no real need to show the battle with the guards; the Ultimage has got the powers of a god, so it’s not a suspenseful fight. By just consigning that battle to a line in a caption, and cutting right to the Queen and Princess surrendering, I saved precious space, without losing anything important from the narrative. Which is important, because I have a limited number of pages to tell this story. I haven’t written the whole thing, but I’ve planned it for 30 pages, and I think it’s going to work. 3. I’m happy to see that Sam chose to make Queen Caroline and Princess Audrey look a lot like the toys that inspired them. Not surprisingly, they’re named after Abi’s friends Caroline and Audrey. 4. It’s hard to believe, but Swann Castle and Luxum the city-moon first appeared way back in Chapter 2, on page 34, when Jaxula was describing where he was from. I knew it would be a long time before we got there, but I wanted to show the castle early on. I’m so happy to finally be telling this story. On the next page, Amazing asks Jaxula how he and Brianna met. Jaxula says, “That’s . . . complicated.” You’ll find out how, in just a couple of pages! 5. 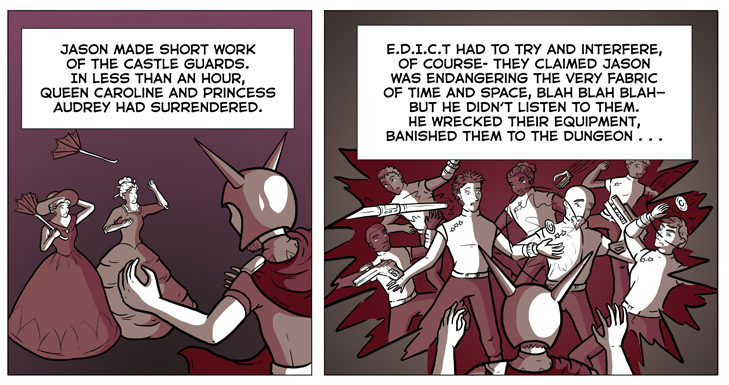 I’m glad to see some E.D.I.C.T agents in action; it’s a shame they get taken out in one panel. Hopefully that doesn’t make them look too ineffective. 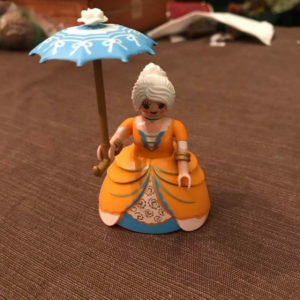 Look closely, and you’ll see Jaxula in there. 6. As I’ve said many times, The Electric Team is based on characters and concepts that Abi and I made up while playing with toys. In most cases, the stories are not based on specific events from playing, but our current story is an exception. Jason Occult took over the castle in an epic tale that unfolded in our basement in July of 2013. We got a lot of material out of that. 7. I asked Sam to design Brianna a new outfit for this page, making her look like a super-villain. I didn’t specify that she should put spikes on the shoulders, but I’m so glad she did. 8. When I first described Brianna to Sam, way back when we started work on this comic, I said, “She used to be a villain.” At first I considered revealing this part of her background at the beginning, but I quickly decided it would be better if Brianna and Jax were keeping it secret. More potential for drama that way. It’s been a long road, with occasional little hints, but we’ve finally made it. 9. If you’re a servant to someone rich and powerful who mistreats you, you might learn the lesson that it’s wrong for people to abuse their authority. 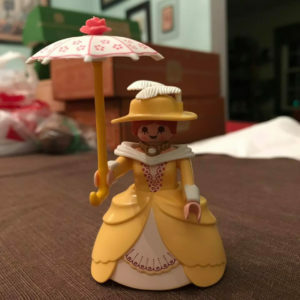 Humans being what they are, though, it’s likely that you’ll learn the lesson, “Someday I will be the master, and I’ll have my own servants.” That’s where Brianna is at this point. 10. Brianna first tasted chocolate when Jason gave it to her when they first met. Remember? This is it–everything changes! If you haven’t yet read page 251, READ IT NOW!!! 1. When I was writing that first line of text there, I instinctively lapsed into Stan Lee mode, like I do every time I’m trying to write some kind of hype, and had to force myself to leave out the “True-Believers” and “Face Front” and “Pilgrims.” What I’m saying is, let’s take a moment to acknowledge the many ways that Stan Lee changed all our lives. Here’s an article I enjoyed that grapples with Stan’s complicated legacy. 2. So Jason has become the Ultimage. We’ve been headed to this point for a long time . . . the Ultimage was first mentioned on page 214, when Bart “Daredevil” Hill said that the Professor had helped battle the Ultimage. We saw a flashback to when Bart got recruited to fight the Ultimage on page 231, then saw a bunch of super-heroes fighting the Ultimage (in silhouette) on page 232. 5. I mentioned at the time that I had a lot of trouble figuring out the details of this section of the story, starting on page 248. I knew that Jason ended up with the powers of a god, and that a.) the process of getting those powers had to be something I could cover in a few pages, and b.) it couldn’t be so easy that it seems like other people would have done it first. So I needed him to figure out something that allowed him, through a series of steps, to acquire cosmic power. To review, he figured out that Mefford’s Medallion was actually the Amulet of Othyg-Zoag, from another world, and that he could use it to open the Vault of Varlo, which got him Sigismundo’s Cloak, which he could use to defeat Skelman the Sorcerer and take his spellbook, and then with the cloak and the spellbook he could draw on the raw energies of the dimensional junction itself. That works for me, at least, hopefully it does for you as well. 6. When I was plotting this series of steps, I couldn’t help but be inspired by Thanos Quest, the two-issue mini-series by Jim Starlin and Ron Lim that Marvel published back in 1990. This is the story where Thanos acquires all of the Infinity Gems and becomes all-powerful. What’s amazing is that it happens so fast–it takes about an issue and a half–and yet it’s satisfying, because he outsmarts all his opponents in fun and interesting ways. I’ve reread this story recently, and it still works for me. 7. Jim Starlin’s still writing Thanos stories. I just read the new one this last week, in between writing about his Adam Warlock last time and Thanos Quest this time. Starlin on the brain, apparently. I might write a longer blog post about Starlin’s cosmic Marvel work sometime, but for now I just want to mention that, as he keeps writing these stories, it gets increasingly easy for Thanos to become omnipotent. Apparently the universe is just filled with plot devices that, with mild effort, you can use to turn yourself into God. After reading the latest one, I thought, man, I shouldn’t have stressed so much trying to come up with a way for Jason to become the Ultimage. 8. I am aware that this story is called “Brianna’s Story,” and that the last few pages have focused mostly on her boyfriend. I don’t want to sideline Brianna in her own story, but like I said, I felt like Jason becoming a cosmic super-villain warranted a few pages of explanation. Don’t worry, once they take over the castle on the next page, we’re switching our focus back to Brianna where it belongs. 9. I’m also aware that the two inspirational comics I mentioned above are from 1986 and 1990 and I am, in short, a dinosaur. We’re serializing The Electric Team online but it’s not exactly a web comic–I write for the individual print issue more than I do for the weekly episode, and I’m not really in touch with web comics culture. Our goal is to be an all-ages comic, so I think it’s fair to ask, if you want to reach today’s youth, should you really be looking back to comic books by Jim Starlin and Marv Wolfman and Frank Miller and the rest? There are so many dynamic young creators out there who grew up with web comics and anime and modern media, who aren’t influenced by moldy old Marvel and DC super-hero comics, and they’re the future. Sam Albert and Abigail Connor, for instance, the other two thirds of our creative team, bring a more current perspective to the Electric Team, and I’m sure they’re both going to go on to do great solo projects some day. For now, though, I appreciate that they let me indulge my old man’s ways, paying tribute to the comics of my youth. 10. I’ve mentioned before that Brianna and Jason Occult predate the other characters in the Electric Team. Now the truth can be revealed! Before we got the toys that inspired the Electric Team, Abi and I played with another group of toys that we called the Super Team. Jason Occult and Brianna were villains who fought the Super Team. But if that’s true, how did Brianna end up joining the Electric Team? Keep reading, pilgrim! Page 250 is here! Read it, if you haven’t already. 1. I can’t believe we’ve reached page 250—that sounds like such an impressive number. That’s more than 14 issues of a 24-page comic book. Watchmen was only 12 issues! Okay, page counts don’t actually equate to merit, I know that, but we should get some points for perseverance. 2. Look, it’s Skelman the Sorcerer! He’s a character that Abi and I created at the same time as Jason Occult, both of whom predate the Electric Team. He’s not a major character in our story, but I’m happy he’s finally made it in. As you can see, she put her own spin on it. 4. I would say that Adam Warlock is my favorite non-Kirby Marvel Comics character, except that Jack Kirby kind of did create him. Kirby created Him, the golden artificial being who debuted in Fantastic Four, but it was Roy Thomas who renamed Him Adam Warlock, and gave him a new personality and a new mission, and Gil Kane who redesigned his look. 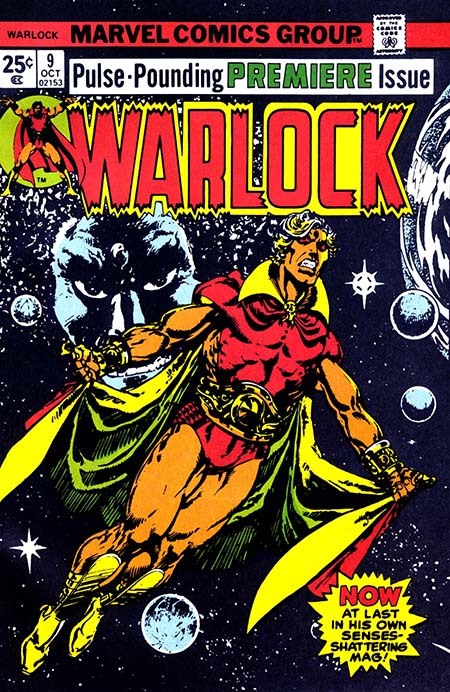 Then it was Jim Starlin who took over and made Adam Warlock into the character we know and love today, to the point where most people think of Warlock as a Starlin character. Is Adam Warlock really the same character as Him? I don’t know, I can see both sides of the argument, but either way it’s the Jim Starlin stuff I love. 5. 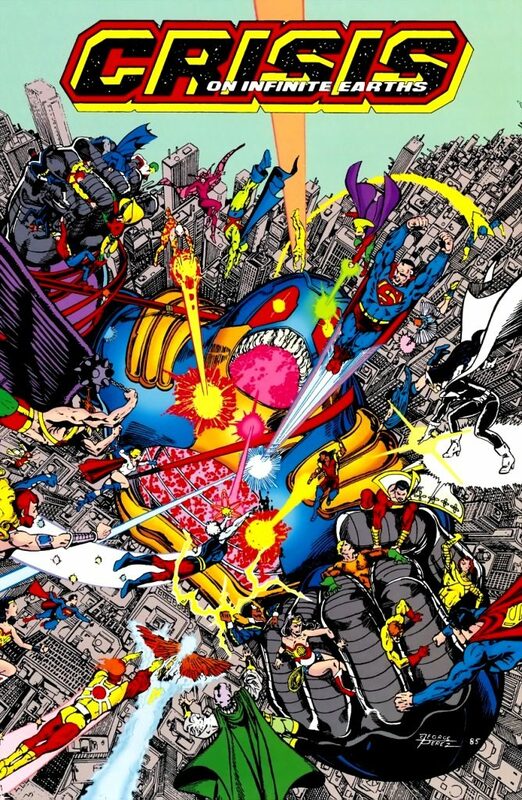 Most comic book characters were created by one or two people; the really complicated ones are the exception. Probably the big name character with the most ambiguous set of creators is Wolverine. Roy Thomas, who was editor at the time, had the idea for a Canadian super-hero named Wolverine. John Romita, who was the art director, designed the costume. Len Wein wrote the Hulk comic that Wolverine first appeared in, and Herb Trimpe drew it. But that version of the character is only vaguely recognizable; Wolverine didn’t become popular until they put him in the X-Men, where he was written by Len Wein again and drawn by Dave Cockrum, but Wein left and Chris Claremont took over, and it’s Claremont and Cockrum who really defined the character. So it seems like you’d almost have to say that Wolverine was created by Thomas/Romita/Wein/Trimpe/Cockrum/Claremont. Of course, Wolverine didn’t get really popular until John Byrne started drawing him . . .
7. Okay, back to page 250. The script called for Jason to turn Skelman to stone. I thought that might be hard to pull off, and I didn’t know how Sam would choose to illustrate it, but I’m very pleased with the way she did. 8. I have a story in mind that I’ve wanted to write for years, about Skelman the Sorcerer’s childhood, back when he was little Sebastian Skelman. It’s a gothic horror story. I imagine it being black-and-white, in the style of a 70’s magazine like Creepy or Eerie. Maybe someday. 9. There’s some important character stuff going on here on page 250. We’re moving fast, in this story, and there’s lots of summarizing, so I thought it was important to stop for a moment and check in on the characters. As we can see, Brianna was happy with their carefree criminal lifestyle, running around having adventures, and has no interest in accumulating power. Jason, on the other hand, seems to have some sort of hunger for power, and apparently he’s been planning this all along. 10. As you may have noticed, this story has changed its color scheme every few pages, with each color scheme representing a new phase of Brianna’s life. We’re due for another color change on our next page, as we move into our final phase. That will be here in two weeks! Get ready!